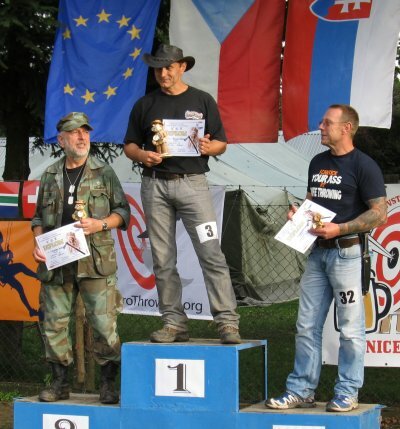 Report on the 13th European Championship in Knife Throwing and Axe Throwing, September 2013, Nivnice, Czech Republic. 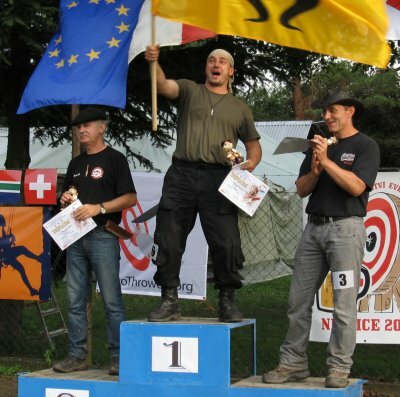 Officially, the 13th European Championship in Knife and Axe Throwing started on Saturday with awards being handed out. Participants came from 13 nations (CH, CZ, DE, FR, HU, IT, LT, LV, PL, RU, SK, UK, ZA) , with some of them travelling quite a distance (South Africa, south Russia). To give them the opportunity to settle down, registration and training targets were already open on Friday. 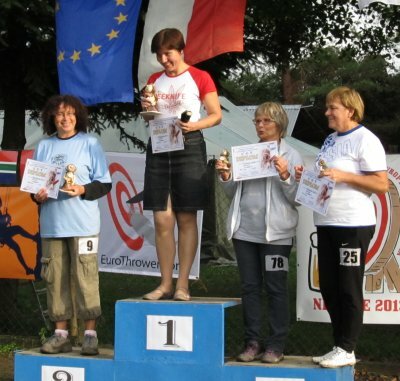 The local organiser W-Club had selected a very appealing area, with hotel, restaurant and holiday homes right on site - and enhanced it with 24 competition targets, 3 training areas and a special site for long-distance training. In the evenings, many throwers found together in big groups in the hotel's restaurant. It felt like being in a summer camp for knife throwers. Even the constantly pouring rain did not manage to dampen the spirits. 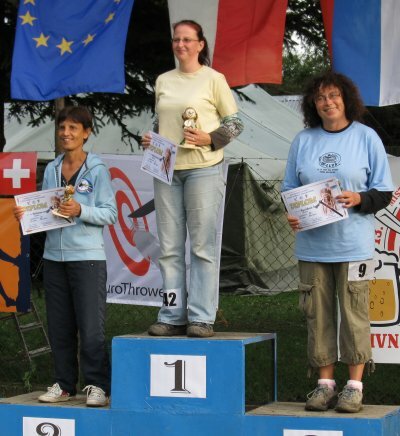 The throwers were just too occupied with training, competition throwing and having a look at the newest rankings handed out by the ladies from the administration. And hot tea, goulash and honey wine were available any time to keep you warm. 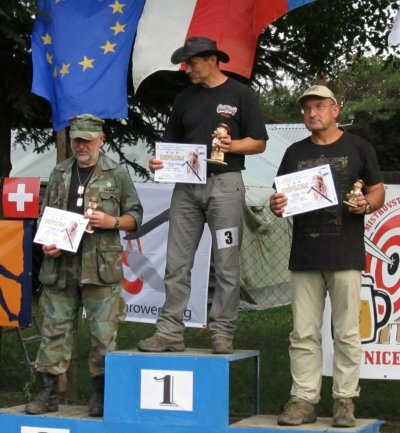 The official part started Saturday, with a handing out of certificates and medals for the current European record holders (donated by Mikhail Sedyshev and Boriss Mihailov). 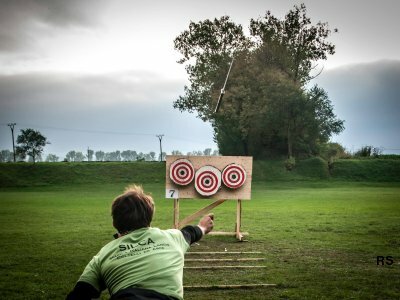 Owing to the numerous targets and arbiters, the throwing in the precision disciplines ( standard rules, knife 3m, 5m, 7m and axe 4m, 7m) went so quickly that in the evening, the long distance event knives could already be tackled. 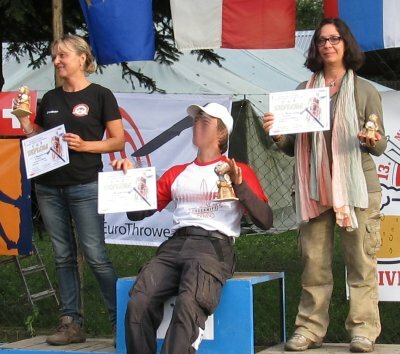 Throwing together and mingling with other sports knife throwers is the most important thing at a throwers meeting. 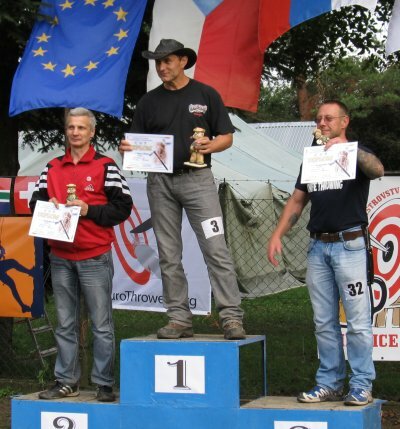 But, since you want to know whom to talk to to get really good, the award ceremony is also always highly anticipated. 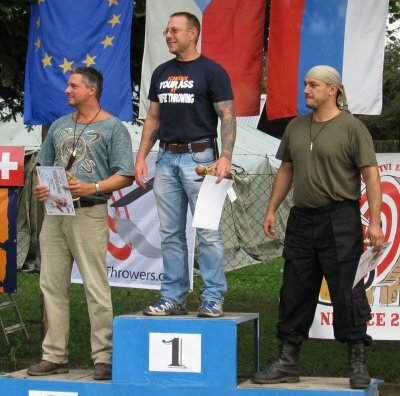 In each discipline, separate for women and men, prices were handed out for the first three: certificates, hand-made ceramic thrower figurines, and sponsored prices (8 Swedish Knifen throwing knives, and 2 Gyro Dart no-turn throwing knives). 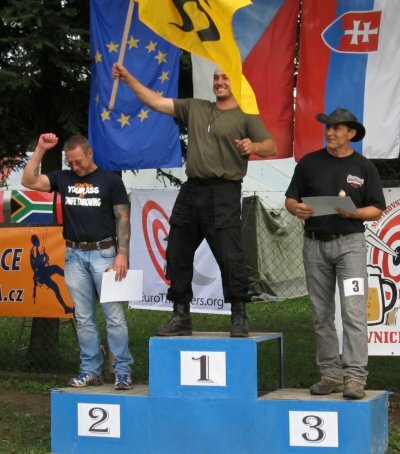 The EuroThrowers association wants to thank all the people who made this succesful thrower meeting possible: The local organiser W-Club, it's president Dušan Dvořák, the big sponsor Žižka. And of course all the other helping hands from Nivnice and from the Naja club who worked in everything from setting up the area to keeping the scores. Richard Sunderland, thank you for the photo marked RS. 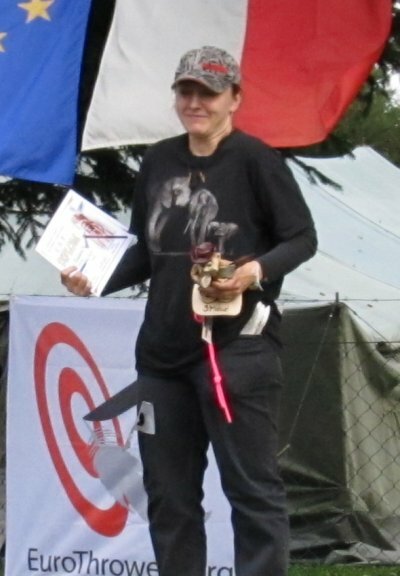 If there was a tie for one of the first three places of an event, those throwers were rated higher that had a higher number of sticks in the bulls eye/5 points (as indicated in ). 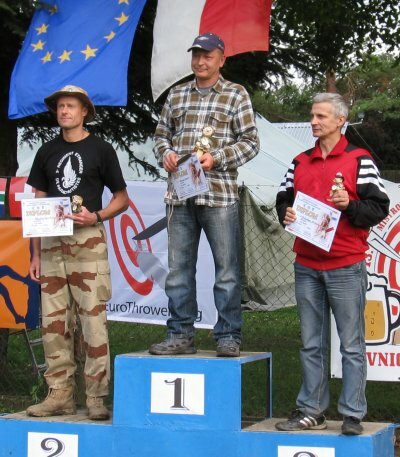 The maximum number of points attainable in each event was 105. 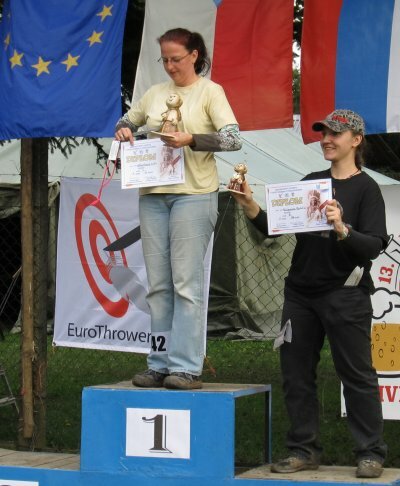 The rules employed were the Standard European Knife and Axe throwing rules (2010 version). 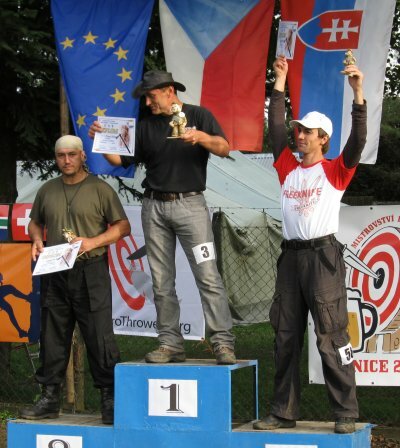 Accordingly, the following events were held: knife 3m, 5m, 7m, distance, axe 4m, 7m, distance event. 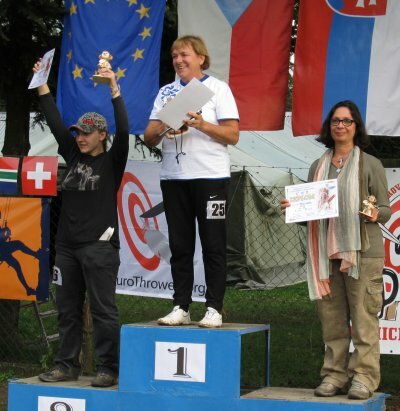 Out of the scope of the European Championship, the EuroThrowers duel-cup was held ( rules). 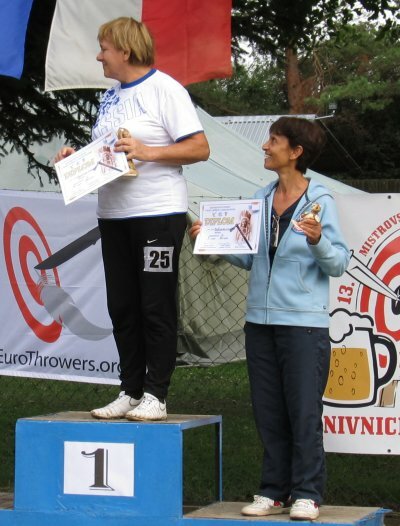 The following changes to the 2013 rules were made to account for local conditions: The target area were the full 50cm, and the throwers had to stand with both feet in the zone stretching from 3m to 4m distance from the target. 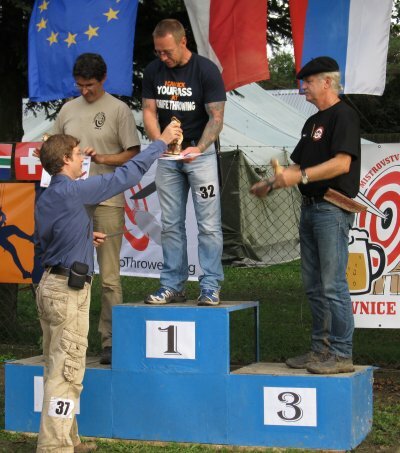 Also out of the scope of the official Championship, the following special event was held by the local W-Club: Axe throwing from 4m while sitting on a bench behind a table.